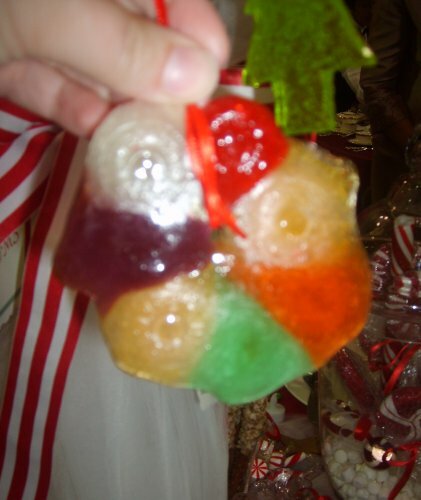 These ornaments are made from any of your favorite hard candies. Such as Jolly Ranchers, Life Savers, etc. Line a cookie sheet with wax paper then, spray a Christmas metal cookie cutter with non-stick cooking spray, and place the cookie cutter on the wax paper. Next place the hard candy/candies of your choice inside the cookie cutter. Now heat in a 350 degree oven until the candy has melted. Remove from the oven allowing to cool, but be sure to poke a hole in the candy with a toothpick before it has completely hardened back up. 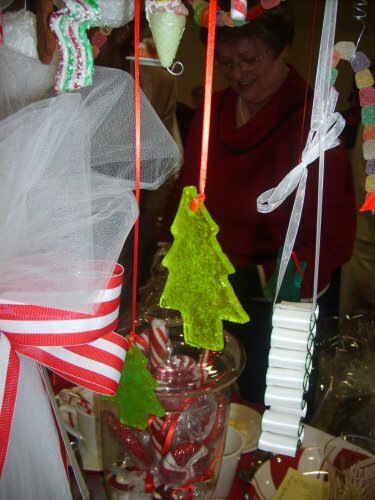 Once cooled remove from the wax paper and thread with the string or ribbon of your choice and hang on the tree. You can also make a tasty Christmas treat to give to children or guests by placing a small lollipop stick into the candy before it completely hardens. Then simply wrap with decorative plastic and give away. You get so many interesting colors and designs when the different candies melt together! Not to mention the interesting flavors you can create. Hope you enjoy my ornament. Copyright © 2008 by Heather Goodrich. All rights reserved.